Some might say that this Chicken Salad is not a “traditional” Mexican recipe, but it is one that has been in our culture for so long that many believe it to be traditional. Why may you ask? Because it is a long-time favorite among Mexicans for family reunions, children’s parties, picnics, and even beach days. Here at home, it is also one of my son’s favorite dishes; ever since he was a small school kid, he loved to come home from school and have this for lunch and often requested it for his birthdays. It is eaten with saltine crackers or in sandwiches, and, as you can see here, served alongside a creamy macaroni salad with American CheeseAmerican Cheese. 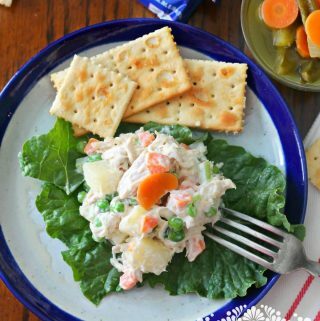 As mentioned before, chicken salad is extremely popular at children’s birthday parties, since the hostess (Mom) can prepare it ahead of time, and still be able to enjoy the party. This chicken salad recipe is a Mexican adaption of the famous Russian salad also known as Oliver Salad in other European countries, but with chicken added (chicken is the main ingredient in this salad). The salad has some of the same ingredients as the Eastern European version, but the Mexican chicken Salad version has several variations, that include ingredients potatoes, carrots, peas and other ingredients like red peppers or corn. I like to add celery and apple to mine. Mix gently and stir in the mayonnaise (carefully, to avoid breaking or mashing the cooked vegetables). Season with salt and pepper. Refrigerate for about 4 hours to allow the flavors to blend. Believe me, it is worth the wait, as it will definitely taste better. Dice the Cheddar or American cheese into small cubes, and make sure the cooked macaroni is cool, otherwise, it will melt the cheese. Mix in the Mexican cream or sour cream. Stir and gently add the Cheese, making sure it is well mixed. As mentioned above, some recipes also add diced cooked ham. Season with salt and pepper. Stir and refrigerate until cool to serve alongside the Mexican Chicken Salad. To serve, provide some saltine crackers, and for the adults, add pickled jalapenos carrot slices. I love to used Glass Bowls that have a convenient lid. This chicken salad recipe is a Mexican adaption of the famous Russian salad, but with chicken added. The salad has some of the same ingredients as the Eastern European version, but the Mexican version has several variations, that include ingredients like red peppers or corn. Place the cooked and shredded chicken, potatoes, carrots, celery, sweet peas and apple into a large bowl. Dice the cheese into small cubes, and make sure the cooked macaroni is cool, otherwise, it will melt the cheese. Mix in the Mexican cream or sour cream. Stir and gently add the Cheese, making sure it is well mixed. As mentioned above, some recipes also add diced cooked ham (if you choose to do so, add it along with the cheese). Season with salt and pepper. Stir and refrigerate until cool to serve alongside the Mexican Chicken Salad. To serve, provide some saltine crackers, and for the adults, add pickled jalapenos & carrot slices. *Some recipes also add diced cooked ham to the macaroni salad. This is one of our family’s favorite dishes for parties and special occasions. Leave a comment, I would love to hear about your family’s favorite party meals! LOL! I have had this at almost every soccer party and day care pot luck. What a perfect recipe. I prefer corn to peas. You should try it Yolanda, is really delicious! Do you know a recipe similar to this one only with pineapple chunks? Do you mean the Chicken salad or the macaroni salad. There is a macaroni salad given at kids parties that is very similar to the one above that also has cream, pineapple and ham added besides the cheese. My husband is convinced you and his Mom, may she rest in peace, were related. His mom used to make this exact same Chicken Salad. He follows you on Facebook and when he saw your recipe he made sure to send me the link. It brought him back many memories of his mom. I made it yesterday and we're having it for lunch today. Thank you for doing what you do. Buenos recuerdos, Mely. Mis tias le cortaban las orillas al"Pan Bimbo" antes de cortar cada sandwich por diagonal. Gracias por las receta. Gusto en saludarte. Si! Mi madre también los corta en triángulos, pero le deja las orillas. Con el pan bimbo. I like chicken salad but without Mayo…one of my favs! My Mexican/English mother-in-law made this at every party she ever had. She used black olives (instead of the apples.) It is a hit every time I make it for family/friends, and I think of her…. 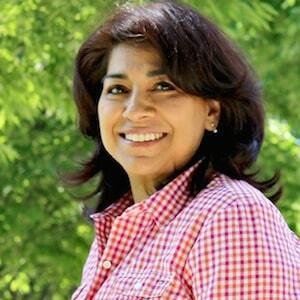 Thank you Mely for showing others that Mexican food is MORE than tacos & enchiladas! Love the idea of adding black olives to the chicken salad. I will try it next time I make it. Thank you! My mother and grandmother made this with tuna(but no apples or celery). I make it now,too, but, because it’s a little more labor intensive, not very often. I’ve usually made “American -style” and I’m sad to say my kids don’t understand my enthusiasm when I do make it. I do use frozen peas because they are a prettier green color. Thank you for the history of it. I had no idea and so interesting. I love this chicken salad recipe! Usually make it during the hotter months. Which is most of the year in Texas. We serve it on tostadas & the kiddos love it. Thank you for all you do, Mely. We use the mayonesa con limón. I debone & shred a rotisserie savory chicken, add cubed potato & carrots. Refrigerate overnight. For the tuna salad, I use cubed carrots, frozen peas & mayonnaise with lemon. My grandmother and Tia’s make this. So glad I found this recipe. I made it for a family party and it was just as we remembered. Thank you! !